Know and share anything that you learned from your personal experiences. It is a famous saying that ‘know and share your knowledge’. Knowing and sharing your personal experiences will help others to take right decisions. We can share our findings on Internet. It is just a matter of giving and taking. We spread happiness and positivism by a giving a simple heartfelt smile. Same way we can spread happiness by spreading good and constructive information. It is priceless quality that benefits all of us. Knowledge is power. This power not shared with others will lose its weight. An average person surfs internet to update its knowledge about anything of its liking. It seeks new information to cope with the new trends of the life. This helps a person to understand demands of young generation. An individual becomes a knowledge seeker who wants to learn something new by surfing Internet. A person learns a lot by personal experiences of others. On this weblog we know and share information and experiences of others from real life situations. We believe this will help our visitors to update their information. They will learn from the experiences of others. Our motto is to “update new information, learn that skill(s) and share the experience with others“. We believe that self learning and sharing knowledge helps us to groom our personality. There is no age limit to learn, to know and to share information which a knowledge seeker wants. We can even learn things by sharing our personal day-to-day experiences with others which no school can teach us. Like Pat Flynn’s blog ‘The Smart Passive Income‘ motivates people to learn from internet by using his transparent techniques. If you like to share something new and interesting, please use comment box under each article. We will appreciate your comments. Your observations will help us to link with right resources on our blogs. Knowledge is power. Knowledge increases the power of thinking. 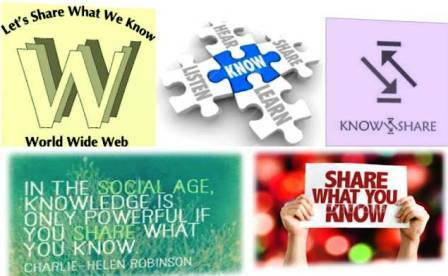 Know and share your knowledge to yourself and for others. Wish you a very happy know and share journey !